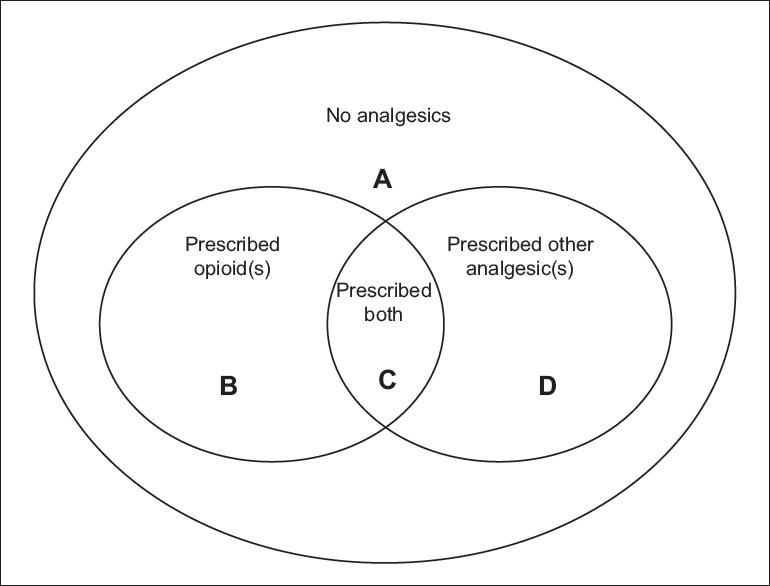 Objective: Optimal pain management in residents requires an understanding of prescribing and administration of opioid analgesics. This study aimed to describe opioid administration for elderly residents in a selection of aged care facilities. Methods: A cross-sectional audit of analgesics administration was conducted for all 458 residents of three-aged care facilities on May 1, 2017. The facilities (each ~160 beds) represented a geographically diverse area in Perth, Australia, and varying service levels by nurse practitioners. Data were accessed using the iCare® platform and transcribed into a customized database. Data were reported descriptively, with relationships between categorical variables examined using the Chi-square analysis. 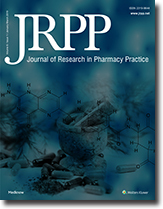 Main outcome measures in the study were the prevalence of administration of opioids compared to that of nonopioid analgesics and no analgesics on the audit date, and characteristics of the opioid prescriptions (the type of prescriber and nursing/care staff involved in the dose administration). Findings: Of 458 residents, 95 (20.7%) received an opioid analgesic on the audit date; 231 had also received a nonopioid analgesic. The most common opioid (34 residents) was a brand of oxycodone hydrochloride and naloxone hydrochloride as 10/5 mg tablets. There was no significant tendency for opioid prescribing by classification of the prescriber, nor for any category of nursing/care staff to administer the particular types of analgesics. Conclusion: The tendency for prescribing of opioids showed no significant among the prescribers. Finally, the administration of opioids was predominantly by caregivers. This represents the first step in a program of activity to ensure the quality use of potent analgesics in an aged care provider network. Objective: High Vitamin D serum level after acute myocardial infarction (aMI) has shown to increase cardiac reconstruction by increasing cell survival and enhancing angiogenesis. Atorvastatin has a well-defined role in both primary and secondary prevention of cardiovascular diseases. It is suggested that this effect may partly be attributable to raising 25-hydroxyvitamin D concentrations. The aim of this study was to evaluate atorvastatin effects on Vitamin D and parathyroid hormone (PTH) levels early after aMI. 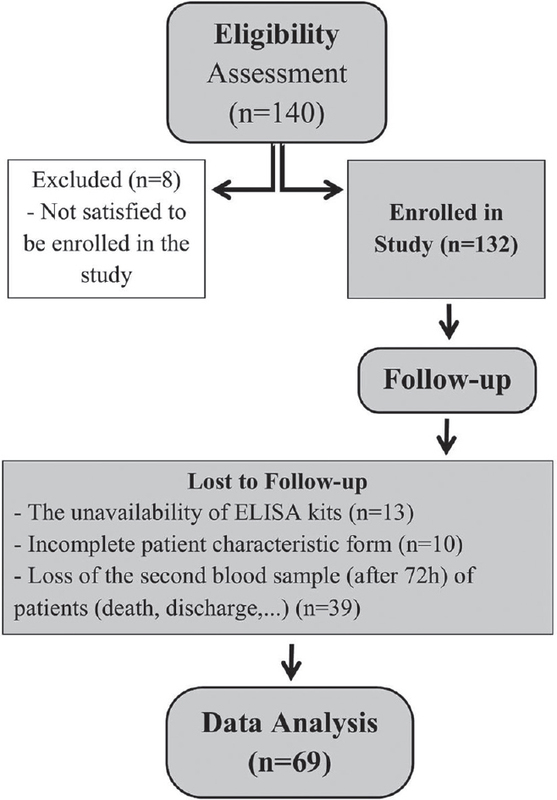 Methods: All patients admitted with aMI in Imam Reza Hospital, Mashhad, Iran, from July 2014 to March 2015, were included in this pre- and postintervention study. Serum levels of Vitamin D and PTH were measured on admission and the 3rd day after administration of atorvastatin 80 mg/day. Findings: A total of 69 post-aMI patients (47 males and 22 females) were enrolled in this study. Serum levels of Vitamin D and PTH were significantly higher (23.52 ng/ml and 46.04 pg/ml, respectively) after 72 h of atorvastatin therapy compared to the baseline (19.66 ng/ml and 31.19 pg/ml, respectively) (P = 0.004 and 0.002, respectively). Conclusion: The early post-aMI beneficial effects of atorvastatin can be attributed to increased serum Vitamin D level; however, atorvastatin cannot significantly decrease serum PTH level after aMI. Further studies are needed to elucidate the clinical effect of atorvastatin. Objective: Evidence-based practice in medical sciences needs to publish confidential evidence that strongly depends on the research publications. This bibliometrics and network analytic study aims to evaluate the research publications of Iranian authors in pharmacology and pharmacy. Methods: Through the pharmacology and pharmacy category of Web of Science (WOS), all published articles affiliated with an Iranian researcher as an author were retrieved. Full records of retrieved articles in the WOS, including author name and affiliation, journal name, citation number, cited references, and keywords, were exported to a plain text file. Network analysis through VOSviewer was used for mapping the characteristics of the retrieved articles. All statistical analyses were done using the Microsoft Excel and SPSS version 25. Findings: The total number of Iran's publications (citations) rose from 1557 articles (10,085 citations) in 2000–2009 years to 6271 articles (77791 citations) in 2010–2018 years. Tehran University of Medical Sciences was the most productive university. 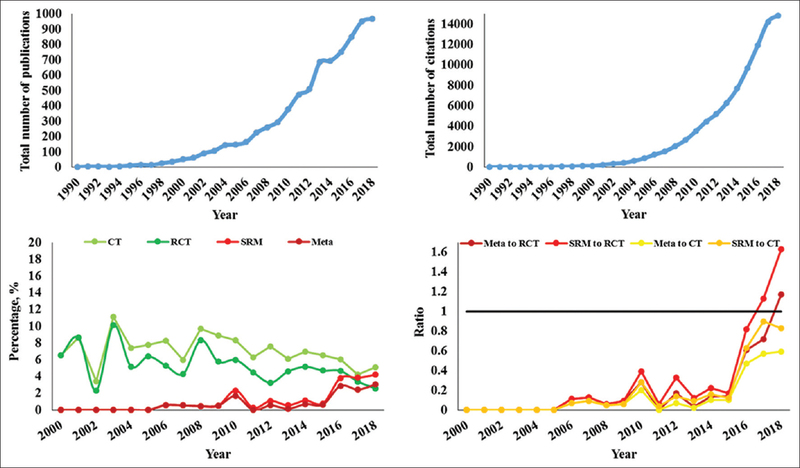 The total number of RCTs rose from 82 publications in 2000–2009 to 278 publications in 2010–2018. The same numbers for systematic reviews and meta-analyses were four publications in 2000–2009 and 169 publications in 2010–2018. The five major topics of researches in pharmacology and pharmacy were drug delivery, basic pharmacology, oxidative stress, animal study, and molecular aspect of pharmacy. Conclusion: This study showed a marked increasing rate of publications and received citations by Iranians in pharmacology and pharmacy. After 2010, the rate of articles in the high-impact journals had growth. Furthermore, research articles in the highest level of evidence were more published by Iranians. Objective: To identify the types, severity, and documentation grades of potential drug–drug interactions (pDDIs) and to identify the predictors of pDDIs among hospitalized cardiac patients. Methods: This was a cross-sectional study. All the patients who were admitted for >24 h in a cardiology ward of a general hospital of the United Arab Emirates and prescribed with cardiac medications were included. The occurrence of any pDDI between cardiac medications and other coprescribed medications was identified using Micromedex database 2.0® and graded and documented based on the severity and documentation. Findings: A total of 842 pDDIs were identified in 155 patients. The overall relevant frequency for the occurrence of pDDIs was found to be 87.74%. A total of 79 pairs of pDDIs were identified. Among identified pDDIs, 41.33% and 56.65% were major and moderate severity type, respectively, whereas 12.32% were excellent and 36.81% were good documentation grade. The majority of pDDIs were between aspirin-bisoprolol (11.64%). Patients taking more than seven drugs (odds ratio [OR] = 9.90; 95% confidence interval [CI]: 2.28–42.99), polypharmacy (OR = 3.86; 95% CI: 0.93–16.08), and number of medical conditions (OR 0.25; 95% CI: 0.09–0.68) were significant predictors of pDDIs. Conclusion: The study fosters the importance of regular and close monitoring for pDDIs among cardiac patients. Thus, multicenter interventional studies are required to determine the exact nature and types of pDDIs in the local population. Objective: Venous thromboembolic events (VTEs) are one of the main causes of death in cancer patients. About one-third of newly diagnosed VTEs are later proved to be associated with cancers. Attempts have been made to prevent these events and reduce substantial burden on patient health. Previous studies have revealed underutilization of thromboprophylaxis in cancer patients. With respect to the high rate of enoxaparin prescription in our institute, irrational utilization of prophylactic measures was anticipated. This study aimed to evaluate the appropriateness of thromboprophylaxis in hospitalized cancer patients. Methods: Medical records of 199 cancer patients hospitalized in two oncology wards of a tertiary care teaching hospital were investigated retrospectively. Data extraction was performed by two clinical pharmacists. Appropriateness of thromboprophylaxis was determined using a local protocol prepared based on international guidelines. Findings: Forty-seven out of 199 prescriptions (23.5%) were appropriate according to the local protocol. About 76% (149/199) of patients did not have any acute medical illness or risk factors for thromboembolism and were admitted only to receive short-course chemotherapy. Enoxaparin was the drug used for 197 patients and unfractionated heparin was used for only 2 patients. Dose adjustment was not performed in three patients who needed dose modification with respect to renal impairment or obesity. Conclusion: This study has found that the frequency of thromboprophylaxis was considerably high in the study population. In the absence of an acute medical illness or other risk factors, hospitalization per se does not justify the administration of pharmacologic agents for thromboembolism prophylaxis. Implementation of local protocols prepared based on international guidelines seems necessary to rationalize thromboprophylaxis. Objective: The community pharmacist's role is in constant evolution. It shifted from compounding and dispensing to patient-centered services. To guarantee that all pharmacists are providing a service of appropriate quality to every patient, the Lebanese Order of Pharmacists (OPL) took the initiative of developing good pharmacy practice (GPP) guidelines to be applied by community pharmacists for services' quality improvement. Methods: Within the OPL, a Scientific Committee, the executive authority to organize scientific and educational activities, is appointed. It decided, in January 2018, to elaborate GPP guidelines for community pharmacists and created the Community Pharmacy Practice Subcommittee, which was in charge of this project. The GPP standards suggested by the OPL were inspired by the ones published by international organizations, namely the International Pharmaceutical Federation and WHO, American, European, and regional countries. Findings: The GPP standards comprised 15 sections that tackled the following topics: settings of a pharmacy, handling of stock, extemporaneous compounding, provision of medicines, supply of nonprescription medicines, interaction and communication, documentation systems, equipment, resources, health promotion, diagnostics, pharmacotherapy monitoring, research and professional development, trainees, and para-pharmaceuticals. Conclusion: The OPL was able to implement a first draft of the GPP standards for community pharmacists in Lebanon, a developing country with many constraints. The starting project will need to be consolidated by raising awareness and changing misconception among community pharmacists as a first step. Amendments to these guidelines will follow based on the pharmacists' feedback and results of an ongoing national survey conducted by the OPL and academia.